The unsuspecting member of a hunting party in the French countryside, Tristan is out of place. Cajoled into going by his wife, who is anxious to ingratiate herself with the locals of their new village, Tristan's companions are Pastis-swilling tough guys with designs beyond catching dinner. Gentle, reflective Tristan has no intention of killing anything, so when his shot inadvertently grazes a rabbit, he saves the animal and hides it in his bag before the others notice. Tristan soon finds himself deeply connected to the wounded rabbit, whose voice comes alive to share its wisdom with the young man. Suddenly, the weather turns and a terrible storm descends upon the party, as well as their village. 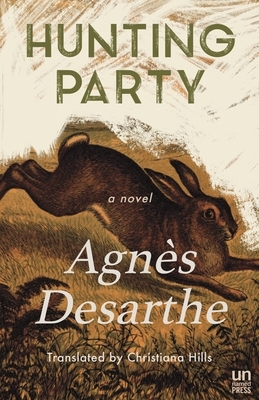 In the valley below, the rushing water exposes the close-knit community's secrets and indiscretions, while Tristan and the rabbit must confront something far worse. AGNES DESARTHE was born in Paris in 1966 and has written many books for children and teenagers, as well as adult fiction. She won the Prix du Livre Inter in 1996 for Un Secret Sans Importance and has had three previous novels translated into English: Five Photos of My Wife, which was short-listed for the Independent Foreign Fiction Prize and the Jewish Quarterly Fiction Prize, Good Intentions, Chez Moi, and The Foundling. CHRISTIANA HILLS translates written works from French into English, specializing in contemporary literary fiction, with a particular interest in experimental works and the Oulipo. She is most recently the translator of Michele Audin's One Hundred Twenty One Days and Agnes Desarthe's Hunting Party.